Taking the Barossa to a whole new level! 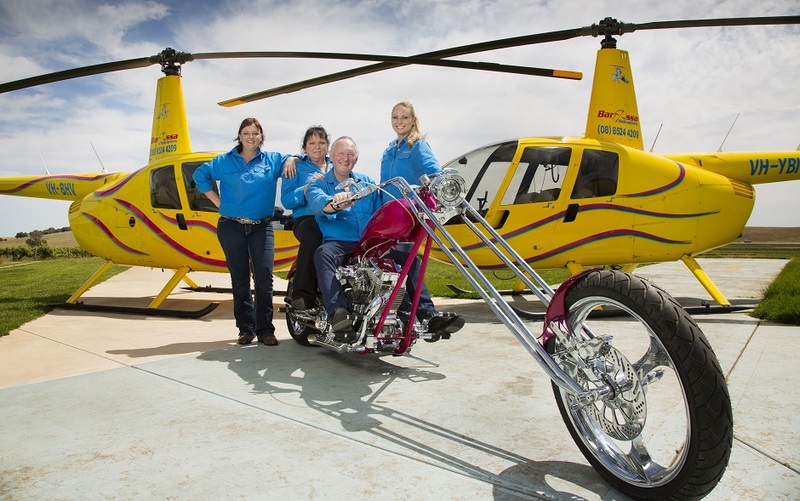 Peter “Goose” Kies had a dream……to own not just the helicopter “choppers” but a road “chopper”! Goose built his first bike in the 1970’s and over the years has had various other bikes, but they had to be sold on to help pay for the helicopters! This is the end product of his passion for “choppers”! TIME TO CONSTRUCT: 3 years from the day the frame went onto the stand. 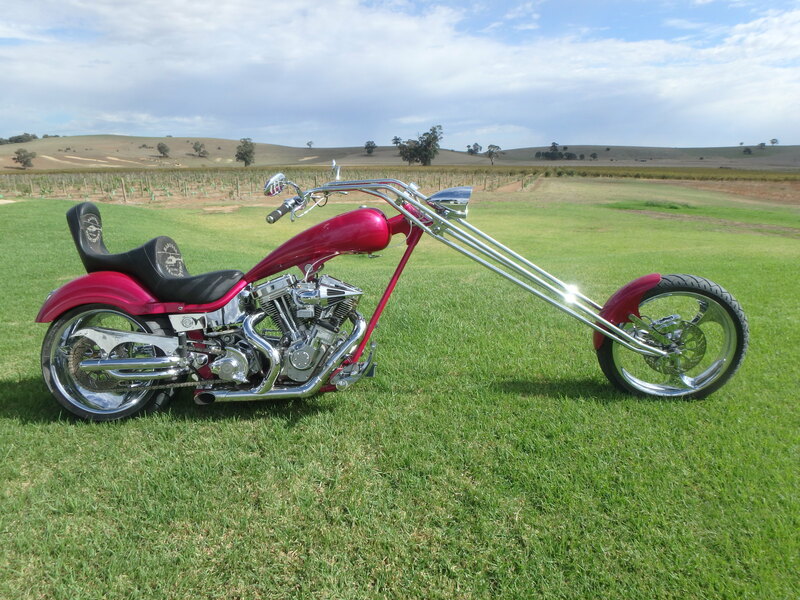 BUILT BY: Bill Holland of Executive Choppers from Roseville, California, USA. FRONT END: Custom by Bill Holland – Harmon front end. 29”/73 cm over stock, made out of chrome molly. FRAME: Rolling Thunder, Saint-Come, Quebec, CANADA. Top tube 6″ / 15 cm stretch; front tubes 8″ / 20cm stretch. 52 degree neck rake and 6 degree in the forks. Total of 58 degree rake. SEAT: Combination of Italian Leather and Sting Ray hide. Custom design by Vince Delgado of SeatWorks, Sacramento, California, USA. The white oval shape on the seat is Vince’s Trademark. BODY PAINT: House of Kolor, Garland, Texas, USA. INDICATORS: Turning indicators are built into the sides of the front headlight and rear in number plate. ACCUTRONIX: ALL forward controls, rear pegs, handle bar grips are all ACCUTRONIX. 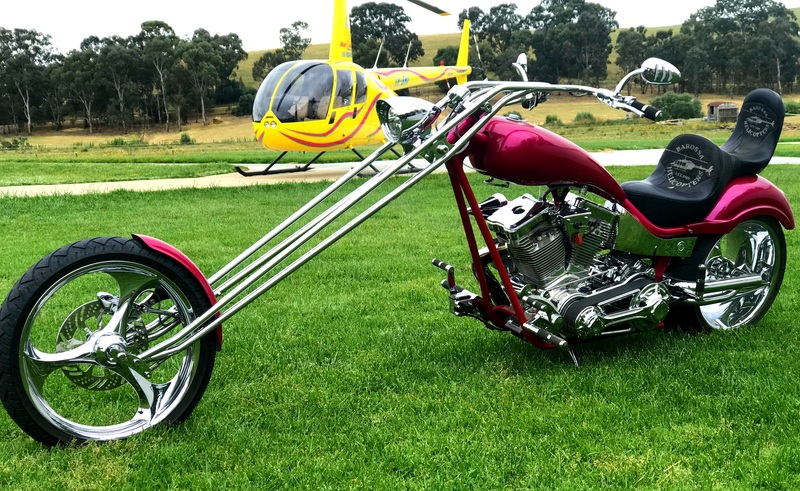 Have you ever dreamed of owning a custom chopper like this one? We have been in discussions with the State Government to legalise this bike on the road.